Enjoy a strong, beautiful smile at any age with the help of Carolina Dental Arts. Our orthodontists are proud to offer our patients Invisalign® in Raleigh and throughout North Carolina. Invisalign is a great option for patients who are concerned about how they would look with braces but don’t want to compromise effective results. Its smooth, plastic aligners are comfortable and discreet, while still adjusting your teeth toward the smile you have always wanted. Carolina Dental Arts recommends that patients wear their Invisalign aligner for 20 to 22 hours a day and remove during meals for the best results. 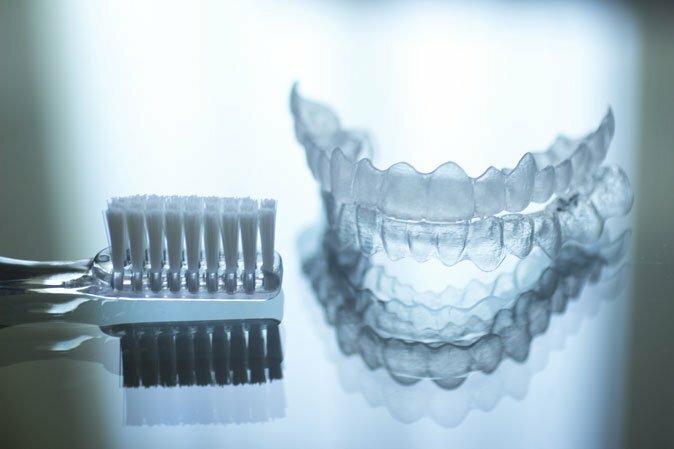 Not only does Invisalign work, but the aligners are barely visible, making this orthodontic procedure a popular choice for adults and teenagers alike. These invisible braces offer a number of benefits, as they are easy to use and have a minimal impact on your daily life. There is no need to change your eating habits, and, as your device is removable, you can brush and floss your teeth as you normally would. Are you ready to take the first step toward healthy, aligned teeth? Contact our dentists to learn if our NC Invisalign is the best option for your orthodontic needs, and we will gladly help you achieve your ideal smile!